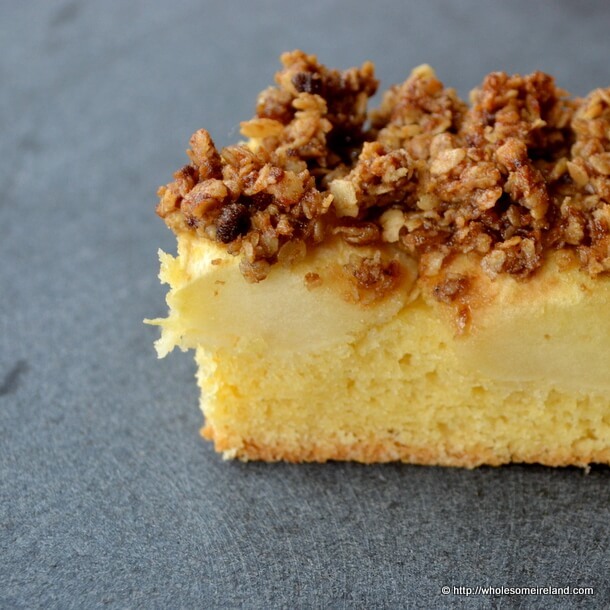 Warm or cold, this cake with apple and a dark crumble topping is the kind of food I like to eat at home. I’m reliably informed it’s Bramley Apple Week in the UK. Seriously though, do we need a week to appreciate apples and cake together? I don’t think so! As we say around here; “it’s mucky awuld weather” outside. The wind is howling up and down from the beach with drafts of pelting rain which are wet. I mean wet rain, as opposed to the lighter, drizzly stuff that makes it a soft kind of a day. This is harsh weather, it’s ruddy cold too. I’ve a warming broth ready for when hubby gets home from work and the Apple Crumble Cake slice isn’t long out of the oven. Perhaps it’s not what everybody would call romantic but making the time to share a meal together when the kids are gone to bed is the best we can do lately. So I try to make the best food possible for us to dine in style. Both dishes are proper winter warming material. Perhaps the best accompaniments to the cake will be a good pour of fresh cream and lashings of hot tea to wash it down. 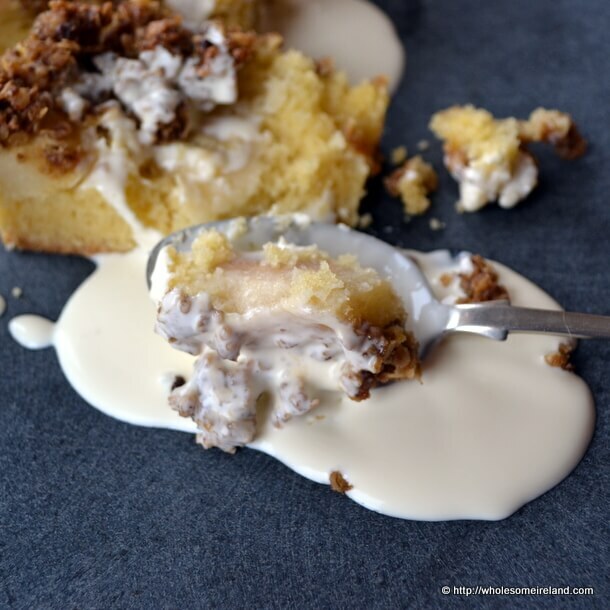 I’m still very much in love with the Avonmore Fresh Dessert Cream, the perfect side to match a classic apple tart or this Crumble Cake. The beauty of this cream is that it’s already slightly sweetened and half whipped. This is the source of much Christmas Day strife in our family as my hubby and their brothers vie for their “puddy” with pouring cream, whipped cream and both. I say hang the hassle, expense and just use Dessert Cream instead! The recipe serves 16 people very comfortably. I bake it in a deep square earthenware dish. You need something deep to hold the 3 layers so that they don’t spill off over the edge. The cake section is denser than a normal Victoria sponge as you need it to hold the pieces of apple on top of the sponge, rather than them falling below the mixture. Peel, quarter and core the apples. The pieces should be large, not small slices. Put them into a large bowl, cover with water and squeeze the juice of the lemon into the water. Stir well. This will stop them turning brown while you prepare the rest of the Crumble Cake. Preheat your (fan) oven to 180 degrees Celcius and line your baking tray/tin well. In a large bowl, beat the dark brown sugar and 75g of softened butter together until you have a brown, nearly fudge-colour batter. Stir in the rolled oats. It will get a bit clumpy, so use a fork to separate them out a bit. Finally, to make the sponge, cream the remaining butter and sugar together. Add the eggs one by one, continuously beating so that you have a light batter. Once the eggs, butter and sugar are well mixed, add the flour, cinnamon and baking powder. Beat well so that you get a stiff batter. Spoon the batter into your lined baking tray/tin. Using the back of a wetted spoon (this stops the batter from sticking to it) smooth out the batter evenly. Next place the pieces of apple on top of the cake batter and finally sprinkle the crumble mixture on top. Bake in the oven for approximately 45 minutes. Check the very centre of the baking tray with a cocktail stick/skewer after this time to see if any batter sticks. If you get a wet result, then bake for a further 10 minutes. If the skewer comes out dry and clean then remove the Crumble Cake from the oven. Allow the cake to rest for about 30 minutes in the tray before carefully lifting and slicing. Serve with lashings of fresh cold, cream. It’s like a heavenly combination eh? I’m delighted to hear it thank you! Yum. Gah, I’ve no apples. Perhaps some soft fruit instead. Apples aren’t conditional. Pears? Pineapple? Their is great joy in a lovely bit of hot custard alright. Lovely! Looks like a great treat, especially drizzled with that cream! Thank you Laura, cream is a serious treat alright. Just made this: a couple of transAtlantic comments – I had to add a generous splash of milk to the cake batter to loosen it up; the air here is much dryer and mine was practically crumbly without it. Also, Bramley apples (I didn’t even realise that was the proper name for “cookers”) are nowhere to be found here – I always use Granny Smiths for cooking. Also, some more guidance on measurements for the pan/baking dish would be helpful. I made a half quantity (I don’t have 16 people) in a round 9-inch casserole dish, about 2 inches deep, and it was just about big enough. Delicious, though. If anyone can tell me why my (authentic Birds powder) custard never thickens in this country, I’d love to know. I think they do something to the milk. So first, your custard powder! It’s probably to do with the lactose quality in the milk. You just can’t get the same quality milk over there. Which is why our butter is yellow – you know that already! If you really must use the custard powder, add an extra teaspoon of cornflour to the mixture and it should thicken a bit better. Granny Smiths are perfect for this recipe. I use them when I can’t get a decent Bramley. The key is to have a very tart fruit – and no you’re not just limited to apples sandwiched between the sweet cake and crumble on top. It’s a balance kind of thing. 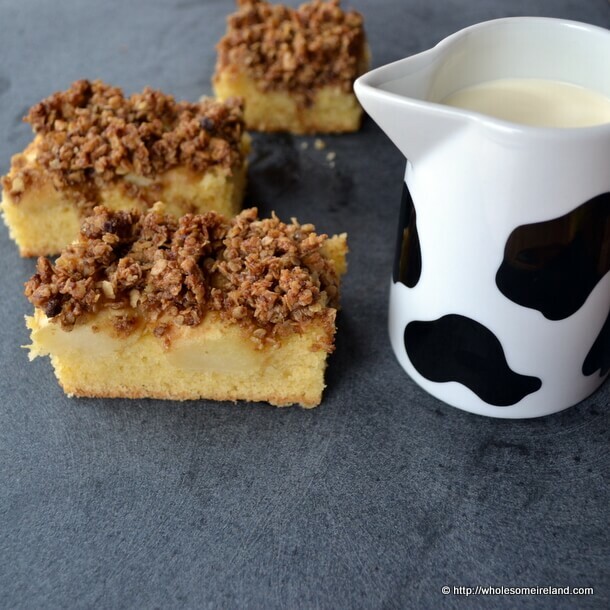 The size dish I use – actually this is the exact dish I used to bake the crumble cake in. It’s the square of this pair from Ikea. http://www.ikea.com/ie/en/catalog/products/10150089/ One of their most versatile oven proof dishes and super value! Rhubarb would be great in this! Thanks for all the answers. Those dishes are lovely – must look out for them in my local IKEA. Oh yes rhubarb would be perfect & it’s just coming into season. Happy baking!